Who are you interceding for? Anyone that has been watching the news lately realizes there is an escalation of persecution for our brothers and sisters in Christ. Egypt, Nigeria, Ethiopia, India and the list goes on and on…. even to a degree here in North America where it is no longer politically correct to stand for the principles of God’s Word and if you do, you may be mocked or criticized. Though Jesus warned us that this day would come, it is difficult to hear how so many are being martyred worldwide for their faith. Most of the perpetuators are extremists on the outside but it is the same spirit of antichrist that ruled the world in times past. It is just escalating as Jesus warned us it would, as time draws closer to His return. We need to not only pray for those being persecuted but that the persecutors will come to know this Jesus that we love so much! Everything we see going on today is a petition to prayer! Pray for North Americans to be bold in Christ and not be as the Word of God says, whitewashed tombs. Spiritually dead on the inside and appearing righteous on the outside! We need to wake ourselves out of a spiritual slumber of comfort and begin interceding for our families, Pastors and those in Christian leadership, churches, friends, leaders of nations, and our brothers and sisters in Christ worldwide! We need to stop wasting so much time doing things that have no permanent value and become warriors in prayer for the lost, the persecuted and for each other. Prayer is the wheel that will begin to get change rolling in the lives of others and ourselves. Without it, we cannot expect to see God intercede. It really does change things, people and situations. The Bible has several verses on praying for others. Too many to list them all here but here is a start…. Matthew 5:4 AKJV44 But I say unto you, Love your enemies, bless them that curse you, do good to them that hate you, and pray for them which despitefully use you, and persecute you. These next few verses in the book of Luke show just how important it is not to quit praying. God hears our prayers and we are not to quit! 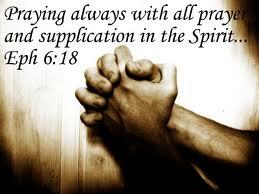 Ephesians 6:18 NIV 18 And pray in the Spirit on all occasions with all kinds of prayers and requests. With this in mind, be alert and always keep on praying for all the Lord’s people. 2 Thessalonians 3:1 NIV 3 As for other matters, brothers and sisters, pray for us that the message of the Lord may spread rapidly and be honored, just as it was with you. 1 Timothy 2:1 NIV 2 I urge, then, first of all, that petitions, prayers, intercession and thanksgiving be made for all people. We have a valuable tool available to us that can bring about enormous change for the lost, the weak, the broken, the persecuted, the hurting, those in authority, those being used by our enemy etc… Let”s use this tool and do what the Word of God says to do! If we spend more time interceding in prayer and less time complaining we will begin to see the changes our hearts long for before Jesus returns!